Pet Friendly Accommodation is an essential resource for anyone who loves to travel with their dog, cat, bird or even horse. 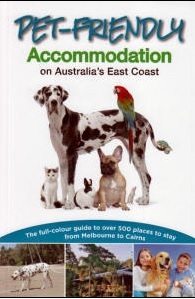 From five-star hotels to secluded camping sits, this book covers most destinations on the east Coast from Cairns to Melbourne, including the major inland towns and cities. No advertising was accepted, and only the authors choice of the best accommodation has been included. Every entry includes a brief, unbiased opinion plus the main details of price range, which pets are welcomed and contact information. All entries are placed on the accompanying maps and many are illustrated with full- colour photographs. Most destinations on the east coast are included, including the major inland towns and cities such as Canberra. Also in the book are sub-sections on great dog-friendly beaches and other exercises areas to be found on the way. Soft laminated cover. Perfect bound. Full colour. 332 pages. 218mm X 150mm. (2012). ISBN 9781921874130.